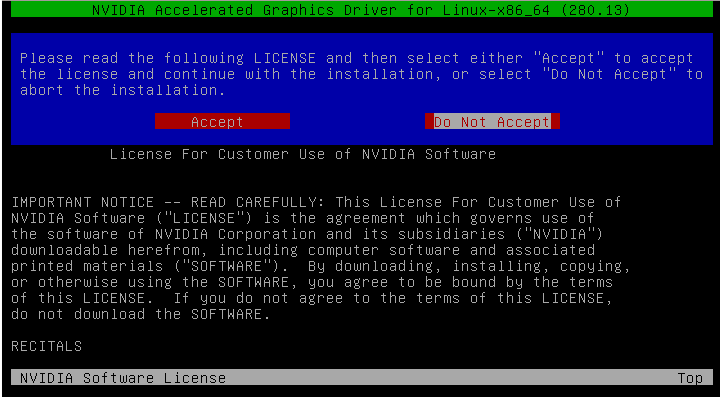 There are several ways to install the driver for your Nvidia card in Debian. So my card is a GeForce GT 330. To get the latest driver just go to this page ( choose Option 1 ) : http://www.nvidia.com/Download/index.aspx?lang=en-us. The latest driver at this moment is Version 280.13 Certified Release Date: 2011.08.01. Just press the Download and Agree & Download button and the file NVIDIA-Linux-x86_64-280.13.run will be saved ( I use 64 bit ). The NVIDIA graphics driver uses a Unified Driver Architecture: the single graphics driver supports all modern NVIDIA GPUs. 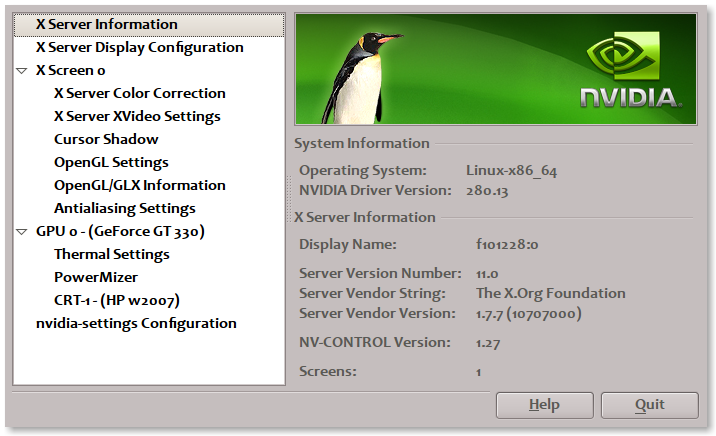 A folder NVIDIA-Linux-x86_64-280.13 is created containing the uncompressed contents of the .run file. On Linux-x86_64, that file contains both the 64-bit driver binaries as well as 32-bit compatibility driver binaries. 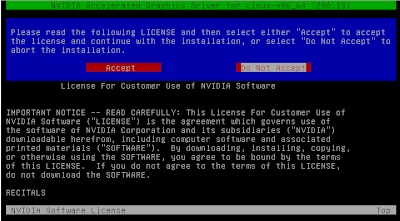 Before attempting to install the NVIDIA driver you should first disable Nouveau. Nouveau ( http://nouveau.freedesktop.org/wiki/ ) is a display driver for Nvidia GPUs, developed as an open-source project through reverse-engineering of the Nvidia driver. Nouveau performs modesets in the kernel. This can make disabling Nouveau difficult, as the kernel modeset is used to display a framebuffer console, which means that Nouveau will be in use even if X is not running. As long as Nouveau is in use, its kernel module ( nouveau.ko ) cannot be unloaded, which will prevent the Nvidia kernel module from loading. 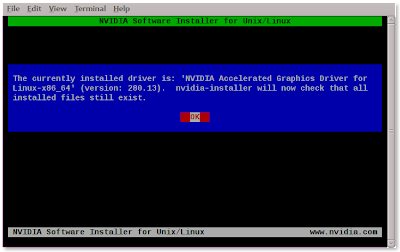 It is therefore important to make sure that Nouveau's kernel modesetting is disabled before installing the Nvidia driver. ( see the README.txt ). login as root, just enter : root and enter root's password. which provides an interactive interface to walk you through the installation. Install NVIDIA's 32 - bit compatibility OpenGL libraries ? if you run amd64. 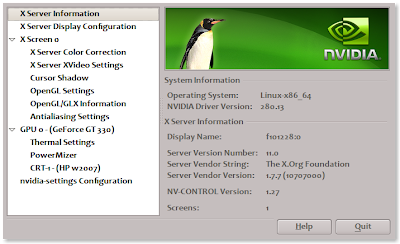 Would you like to run the nvidia-xconfig utility to automatically update your X configuration file so that the NVIDIA X driver will be used when you restart X ? Any pre-existing X configuration file will be backed up. You can access nvidia-settings in the menu : System > Preferences > NVIDIA X Server Settings that allows adjustment of several additional settings. If this doesn't work make sure you have unchecked Include X Display Names in the Config File in NVIDIA X Server Settings at nvidia-settings Configuration. No precompiled kernel interface was found to match your kernel; would you like the installer to attempt to download a kernel interface for your kernel from the NVIDIA ftp site (ftp://download.nvidia.com)? If you know what you are doing and want to ignore the gcc version check, select "No" to continue installation. Otherwise, select "Yes" to abort installation, set the CC environment variable to the name of the compiler used to compile your kernel, and restart installation. before running the Nvidia installer file. (2) Any kernel update or xserver-xorg-core update will force you to reinstall the driver. If there is a more recent driver available, it will be automatically downloaded and installed. Install a kernel module only, and do not uninstall the existing driver. This is intended to be used to install kernel modules for additional kernels (in cases where you might boot between several different kernels). To use this option, you must already have a driver installed, and the version of the installed driver must match the version of this kernel module. thank you for nvidia driver install guide. Thanks a lot!! 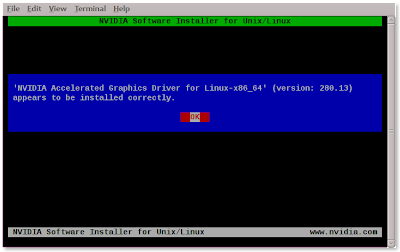 This is the first Nvidia driver install guide for Debian that helps me to complete the installation without errors and Xorg failures. Thanks for your how-to. I managed to get nvidia 295.53 running with kernel 3.2.0-2-amd64 (Debian unstable).